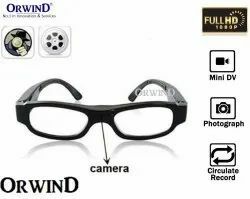 Pioneers in the industry, we offer usb hidden spy camera, usb flash drive mini hd spy cam, spy camera for body, spy camera coin shape & size, wireless spy camera, spy hidden camera with mini digital eyewear specticles dvr dv video recorder and spy camera bulb from India. 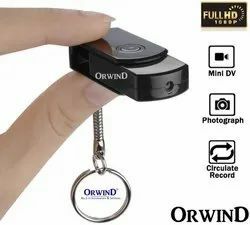 ORWIND MINIDRIVE USB HD 5MP/8MP 4K1080P HD Wireless Hidden Easy Plug & Play CameraUSB Hidden Spy Camera, USB Flash Drive Mini HD SpyCameras U Disc Personal Security Video Recorder withMotion Detection (Upto 32GB Support)KEY FEATURES:-★ Spy camera has real U-Disk USB Flash Drive function,but youneed to correctly insert the sd card to the camera before using. | ★Video Resolution 1920*1080 ;Photo Resolution 1600 x 1200;Recording and Charging Simultaneously | ★Easy to use: OneButton to Get All Function, Beautiful and Practical | ★Ultra SmallDesign: This handy-sized spy camera that you can take it toanywhere. | ★A portable spy camera: This is not just an ordinary UDISK,this is a spy FLASH CAMERA! 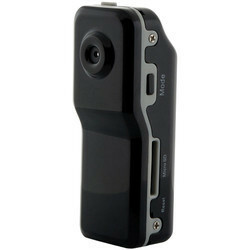 The hidden camera is used bylawyers, private investigators, police officers, students security,office workers, legal, etc. | ★This spy camera has a HD camera witha built-in DVR (Digital Video Recorder) which is used to capture highresolution photos and videos. | ★Supports up to 32GB TF Card inmax(not included). 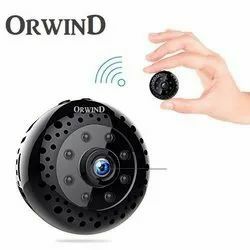 ORWIND MINIWONDER+ SPY5MP/8MP 1080P HD 150°Wide Angle Wireless WIFIHidden Easy Plug & Play Spy Camera Wireless WifiHome Security Camera with Night Vision/MotionDetection/Wide Angle (Upto 128GB Support)Description: ORWIND Memory Card Supported1080P Mini Hidden Security Guard Camera: Supportvideo with 150°Wide Angle to provide completevision,you could control your home situationanytime&anywhere,makes it be a perfect HiddenSecurity Guard for your home,office,store,warehouseand more. 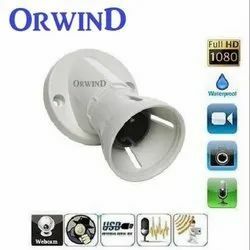 Features*:★ Orwind Wifi Spy Camera-- supports video live steaming on IOS&Andriod,with 150°Wide Angle to provide complete vision,youcould control your home situation anytime&anywhere,makes it be a perfect Hidden Security Guard for yourhome,office,store,warehouse and more★ Multi Support-- support multiple users from one mini spy camera at the same time.Also support multiple cameras on onephone.Makes your home more security without any corner misses.Supports loop recording, and record&playback with local microSD card/TF Card(128GB Max,not included)★ Motion Detection&Night Vision-- Motion detection to trigger your phone alarm without any emmergency delay.Night Vision toprovide clear videoπcture as well as daytime★ How to Use-- Scan QR code on user manual to or search "MyOrwind" from App store&Google play(download app).Turn oncamera,and find camera's wifi on your phone(connect it without network switching);then open APP to add camera,finally paringyour home wifi with camera★ Product Message-- We have tested each product before shipping and make it works well.Please email us for any productissues.With 30 days money back and one year warranty includes after-sale customer serviceAwarded as the Best & the MostReliable Hidden Camera in The World.★ LIVE Camera View on Windows, Android & IOS Through *MyOrwind* APP.Special Qualities:* Resolution:1920*1080P/1080*720/640*480 | Night Vision:Record clearly pictures/videos at night | MotionDetection:Detect movements to trigger phone alarm | Wide Angel:150°Wide Angle to record complete vision | Card Support:MicroSD Card/TFCard 128G Max（not included) | Computer System Support:Windows/Mac OS X | Phone System Support:Android/iOS | Web browser:IE7 andabove,chrome,firefox safari.etc---------------------------------------------------------------------------------------------DESCRIPTION: ORWIND 1080P Mini Hidden Security Guard Camera: Support video live steaming on IOS&Andriod,with 150°Wide Angle toprovide complete vision,you could control your home situation anytime&anywhere,makes it be a perfect Hidden Security Guard for yourhome,office,store,warehouse and more | How to use-- Please email us for any using issues1.Download App-- Scan QR code on user manual to or search "MyOrwind" from App store&Google play2.Connect phone with camera-- Turn on camera,find camera's wifi signal(long name) from phone and connect it directly,and Cancel networkswitch3.Add new camrea-- Open App "MyOrwind",and add new camera4.Pair home wifi with camera-- point setting mark,and select Advance Config,and then select Wifi Config, finally connect your home wifi(wait for1 minutes for automatically connect).Connect it for a few more times until camera is online*OVERVIEW*- ORWIND MINIWONDER+ SPY 5MP/8MP1080P HD 150°Wide Angle Wireless WIFI Hidden Easy Plug & Play Spy Camera*LIVE* Wireless Wifi Home Security Camera with Night Vision/MotionDetection/Wide Angle(iOS&Andriod App) (Upto 128GB Support)*No Prior Specialist Technical Ability Required*Ideal to use at home or in the office this WiFi motion-activated Orwind spy camera (with sound), after initial set-up, does not need to be hardwiredto an Ethernet port or to the WiFi Router. 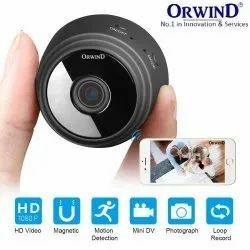 ORWIND SPYWONDER+ 5MP/8MP 1080P HD150°Wide Angle Wireless WIFI Hidden Easy Plug & PlaySpy Camera *LIVE* Wireless Wifi Home SecurityCamera with Night Vision/Motion Detection/WideAngle(iOS&Andriod App) (Upto 128GB Support)KEY FEATURES: ★ Orwind Wifi Spy Camera-- supportsvideo live steaming on IOS& Android, with 150°Wide Angle toprovide complete vision,you could control your home situationanytime&anywhere,makes it be a perfect Hidden Security Guard foryour home,office,store,warehouse and more | ★ Multi Support--support multiple users from one mini spy camera at the sametime.Also support multiple cameras on one phone.Makes yourhome more security without any corner misses.Supports looprecording, and record&playback with local micro SD card/TFCard(128GB Max,not included) | ★ Motion Detection&Night Vision-- Motion detection to trigger your phone alarm without anyemmergency delay.Night Vision to provide clear videoπcture aswell as daytime | ★ How to Use-- Scan QR code on user manual toor search "MyOrwind" from App store&Google play(downloadapp).Turn on camera,and find camera's wifi on your phone(connectit without network switching);then open APP to add camera,finallyparing your home wifi with camera ★ LIVE Camera View onWindows, Android & IOS Through *MyOrwind* APP. 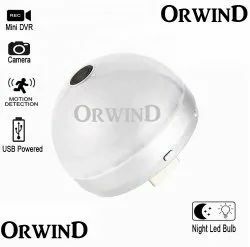 ORWIND CAM BULB PRO+ 4G WIFI5MP/8MP 1080P HD Wireless 360° View Angle WIFIHidden Easy Plug & Play *LIVE* Spy Wireless BulbCamera Night Vision Motion Detection IP Camera (Upto64GB Support)Special Qualities: 1080P HD Wifi Camera,strongnight vision,140 degree wide angle. *Supports Real-timevideo remote view and hear the clear voice in App anytimeand anywhere. *User friendly APP: You can easily monitor,record videos, and snapshot photos anytime and anywherevia Internet connection. *Motion Detection AlarmFunction.Alarming Notifications will be transferred to yourSmartphone when the motion detection is activated. Whenyou go out, you can set your camera to alarm you whencamera detects movement. *The record videos can be storedinto TF card at the same time in order to view it when need. Itmax support 64GB. *TF Card Loop Recording.Insert the TFcard into its slot, power it on, the camera will start to recordautomatically. *Phone can connect max 4pcs Orwind camerasat the same time. ORWIND SAFELIFT+ Elevator HD5MP/8MP Camera with Wireless CCTV VideoTransmissionDescription: ●This device is portable and is able to recordand capture anything at any time. | ●It is easy to use and can be usedby anyone. 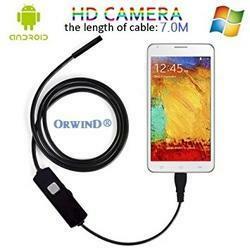 | ●1290P video quality with 90°wide view angle: Yourvideos will come out with impeccable resolution and precision. | ●Thisdevice features 5MP/8MP Motion Detection. | Super Mini Camera:Thesmall and portable design makes it perfect for home security andanything you care about. It can also be used as a home nanny pet babycam.| Built-in rechargeable battery Cam：This mini camera built inrechargeable lithium battery, meets you portable carry recording Upto24 Hours, and if you need more recording time then you can justconnect the camera to either a power bank or an outlet so you canrecord nonstop with no interruptions. ORWIND SIGN-SAFETY+ Exit Sign HiddenCamera with Built-In DVR 1080P HD Wireless WIFIHidden Spy Wall Hanging Sign IP Camera. (Upto 64GBSupport)Description: No one will ever be able to tell this normal lookingexit sign conceals a hidden color camera and mini DVR with an SD cardto record what the camera sees. 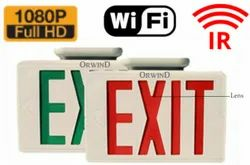 The exit sign plugs into the wall topower the exit sign, DVR and the hidden camera features motionactivatedrecording that starts as soon as motion is detected. Withmotion-activation, you won't have to fast forward through hours ofuneventful recording. Also has Motion Detection Area Masking. Forexample, if you have a dog or cat and don't want it to set off the motiondetector, you can mask the lower quarter of the field of vision so it doesnot detect can view your recordings by using the included RCA cable toconnect to your computer or insert the included 8GB SD card into yourcomputerHC-EXITS-DVR Color Camera With Built-In DVR | FREE 8GB SDCARDIncludedDVR features include: •Motion activated and scheduledrecording •Motion Detection Area Masking •Time and datestamp•Remote Control operation•MPEG4 file format•Composite videooutExit sign is fully functionalDVR Specifications •System:NTSC/PAL•Storage Media: SD Card•Frame Rate: 30 fps at 320x240 DVRRecord Time Resolution 640x480320x240 Frame Rate12 FPS30 FPS HighQuality 8 hrs16 hrs Med Quality 48 hrs96 hrs Low Quality 72 hrs144 hrsColor Camera Specs•Image Sensor: 1/4” CCD•Resolution: 380Lines•Min. Illumination: 1 Lux•Lens: Wide Angle •Power Required: 12VoltsAll necessary power supplies and battery packs are included. 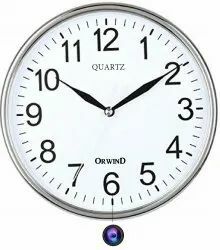 WALL CLOCK SPY CCTVHOME SECURITY CAMERAContact: +91-7777-001500 | Store: IndiaBoosters.com / Orwind.InBEST-IN-CLASSFEATURESORWIND SPY CAMERA’s*Key Features*:¿¿¿ Super Mini Wifi Wireless P2P Spy Camera With Inbuilt Motion Detection. ¿¿¿ Two Way Communication Speaker withMicrophone. ¿¿¿ Continuous Battery Backup Upto 12 Hours. ¿¿¿ Day + Day Vision Clear HD Live Footage with 1080P Recording. ¿¿¿Super Easy To Setup within 160 Seconds. ¿¿¿ Awarded as the Best & the Most Reliable Hidden Camera in The World. ¿¿¿ LIVECamera View on Windows, Android & IOS Through *MyOrwind* APP.Special Qualities:*1080P HD Wifi Camera,strong Day vision,140 degree wide angle. *Supports Real-time video remote viewand hear the clear voice in App anytime and anywhere. *User friendly APP: You can easily monitor, record videos, and snapshotphotos anytime and anywhere via Internet connection. *Motion Detection Alarm Function.Alarming Notifications will betransferred to your Smartphone when the motion detection is activated. When you go out, you can set your camera to alarm youwhen camera detects movement. *The record videos can be stored into TF card at the same time in order to view it when need. Itmax support 64GB. *TF Card Loop Recording.Insert the TF card into its slot, power it on, the camera will start to recordautomatically. 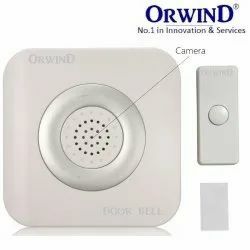 *Phone can connect max 4pcs Orwind cameras at the same time.Highlights: EASY 2-3 MINUTES INSTALLATION | MOTION DETECTION & NOTIFICATION | SUPER SMALL WIFI BASED SPYCAMERA | HIGH VIEW ANGLE PRO HD CAM | TWO WAY TALKING MIC FOR AUDIO/COMMUNICATION. | DAY & DAY CLEAR VISION.| INSTANT SHOOT WIFI CAMERA. | WIRELESS SETUP WITH BATTERY BACKUP FOR | 8-12 HOURS CONTINOUS NON-STOPRECORDING | H.264 video compressed format. 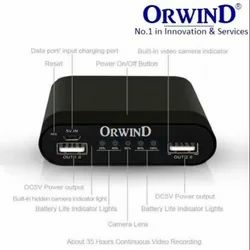 | Specifications of Orwind Spy Range Of Products: 1,Video Format: AVI,2,Resolution: 1960x1080 3,Voice recording Yes, 4,Internal memory Yes, 5,Memory: 64GB, 6,Video file size: >500KB per min,7,Recording mode: continuous recording until memory is full or manually off,Adaptor type: USB adaptor charging cable.---------------------------------------------------------------------------------------------DESCRIPTION: ORWIND 1080P HD Wifi mini spy cam,strong Day vision,140 degree wide angle. *Supports Real-time video remoteview and hear the clear voice in App anytime and anywhere. *User friendly APP: You can easily monitor, record videos, and snapshot photosanytime and anywhere via Internet connection. *Motion Detection Motion alarm Function.Motion alarming Notifications will be transferred toyour Smartphone when the motion detection is activated. When you go out, you can set your camera to motion alarm you when cameradetects movement. *The record videos can be stored into TF card at the same time in order to view it when need. It max support 64GB. *TF CardLoop Recording.Insert the TF card into its slot, power it on, the camera will start to record automatically. *Phone can connect max 4pcs mini spycam cameras at the same time. 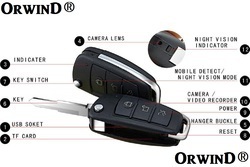 | Brand: ORWIND - SPY CAMERAS | Details Of Hidden Cameras - Type: Hidden Camera | USB Connectivity to PC| Capacity - 64 GB supported TF card | Video Format: AVI - Quality: Full HD-Battery saved design, low voltage indication | Sensor type: Flatsurfaced alcohol sensor | Designed By OrwinD, It has a Very Easy to Install Hidden Camera inside the Bulb to Capture Secret & Spy ConfidentialMoments. This is a latest version of spy camera With a 5.0 megapixel CMOS Lens, It is capable of rendering H.264 videos in 1080P resolution inASF and AVI video formats. Record your videos for 8 hours straight thanks to the provided 4000mAh battery, while storing them in a Micro SDmemory card with a capacity of up to 64GB. You can view them on your smartphone or tablet in realtime too via WiFi.Capture frames covertlywith a 110 degree view angle at 30fps, and enjoy the convenience of timed recording anytime and anywhere you are. You can also save onstorage by engaging the up to 20 meters straight-line distance. =WIFI SUPER MINI CAM SPY CCTVHOME SECURITY CAMERA. 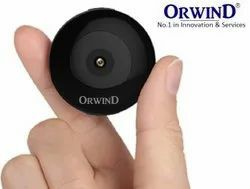 CLASS FEATURES ORWIND SPY CAMERA’s*Key Features*:★ Super Mini Wifi Wireless P2P Spy Camera With Inbuilt Motion Detection. ★ Two Way Communication Speaker with Microphone. ★ Continuous Battery Backup Upto 12 Hours. ★ Day + Night Vision Clear HD Live Footage with 1080P Recording. ★Super Easy To Setup within 160 Seconds. ★ Awarded as the Best & the Most Reliable Hidden Camera in The World. ★ LIVE Camera View on Windows, Android & IOS Through *My Orwind* APP.Special Qualities:*1080P HD Wifi Camera,strong night vision,140 degree wide angle. *Supports Real-time video remote view and hear the clear voice in App anytime and anywhere. *User friendly APP: You can easily monitor, record videos, and snapshot photos anytime and anywhere via Internet connection. *Motion Detection Alarm Function.Alarming Notifications will be transferred to your Smartphone when the motion detection is activated. When you go out, you can set your camera to alarm you when camera detects movement. *The record videos can be stored into TF card at the same time in order to view it when need. It max support 64GB. *TF Card Loop Recording.Insert the TF card into its slot, power it on, the camera will start to record automatically. *Phone can connect max 4 pcs Orwind cameras at the same time.Highlights: EASY 2-3 MINUTES INSTALLATION | MOTION DETECTION & NOTIFICATION | SUPER SMALL WIFI BASED SPY CAMERA | HIGH VIEW ANGLE PRO HD CAM | TWO WAY TALKING MIC FOR AUDIO/COMMUNICATION. | NIGHT & DAY CLEAR VISION. | INSTANT SHOOT WIFI CAMERA. | WIRELESS SETUP WITH BATTERY BACKUP FOR | 8-12 HOURS CONTINOUS NON-STOP RECORDING | H.264 video compressed format. 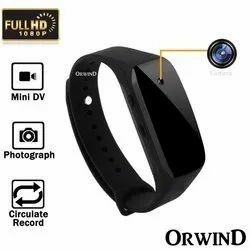 | Specifications of Orwind Spy Range Of Products: 1,Video Format: AVI,2,Resolution: 1960x1080 3,Voice recording Yes, 4,Internal memory Yes, 5,Memory: 64GB, 6,Video file size: >500KB per min,7,Recording mode: continuous recording until memory is full or manually off,Adaptor type: USB adaptor charging cable.---------------------------------------------------------------------------------------------DESCRIPTION: ORWIND 1080P HD Wifi mini spy cam,strong night vision,140 degree wide angle. *Supports Real-time video remote view and hear the clear voice in App anytime and anywhere. *User friendly APP: You can easily monitor, record videos, and snapshot photos any time and anywhere via Internet connection. *Motion Detection Motion alarm Function.Motion alarming Notifications will be transferred to your Smartphone when the motion detection is activated. When you go out, you can set your camera to motion alarm you when camera detects movement. *The record videos can be stored into TF card at the same time in order to view it when need. It max support 64GB. *TF Card Loop Recording.Insert the TF card into its slot, power it on, the camera will start to record automatically. *Phone can connect max 4pcs mini spycam cameras at the same time. 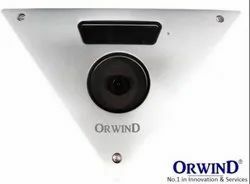 | Brand: ORWIND - SPY CAMERAS | Details Of Hidden Cameras - Type: Hidden Camera | USB Connectivity to PC| Capacity - 64 GB supported TF card | Video Format: AVI - Quality: Full HD-Battery saved design, low voltage indication | Sensor type: Flat surfaced alcohol sensor | Designed By OrwinD, It has a Very Easy to Install Hidden Camera inside the Bulb to Capture Secret & Spy Confidential Moments. This is a latest version of spy camera With a 5.0 megapixel CMOS Lens, It is capable of rendering H.264 videos in 1080P resolution in ASF and AVI video formats. Record your videos for 8 hours straight thanks to the provided 4000mAh battery, while storing them in a Micro SD memory card with a capacity of up to 64GB. You can view them on your smartphone or tablet in realtime too via WiFi.Capture frames covertly with a 110 degree view angle at 30fps, and enjoy the convenience of timed recording anytime and anywhere you are. You can also save on storage by engaging up to 40 meters straight. Features include Full HD 1440x 1080 video capture, easy connection to PC via USB Port for video playback, motion detection, and AVI video recording format, day vision function with external day vision indicator, reset button, and hanger buckle to easily clip onto key ring. This product supports up to 32 GB of memory via external TF card (not included). But wait! This Mini Car Key Spy Cam also includes the special feature of PC camera function for networking purposes as well as a 300mAh Lithium ion battery which lasts for approximately one full hour! Small Pin-hole Camera - easy to carry and hide! 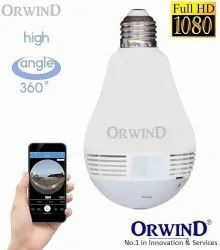 ORWIND PRO LITBULB 5MP/8MP 1080P & 4KFull HD Wireless Latest Lamp Design Light Bulb Spy CameraLighter Hidden WIFI Hidden Easy Plug & Play *LIVE* Mobile AppSupported Spy Wireless Bulb Camera Night Vision MotionDetection IP Camera (Upto 64GB Memory Support) | “Note:WIFI & Non-WIFI Both Models Available as Per YourRequirement”Description:U★ Super Latest lamp design light bulbhidden camera Bulb Hidden Camera Motion detection recording| ★ Automatically recording when power on | ★ Easy to SetupOrwind LitBulb Camera Device | ★ Loop recording automaticallyoverwrites oldest files if the memory fills up | ★Resolutionmode: 1920*1080P |★ LIVE Camera View on Windows, Android& IOS Through *MyOrwind* APP. Indeed a mini -- measuring approximately 2x1 inches, the Mega Mini Spy Camera.is designed to fit in your pocket or bag and be ready for on-the-go recording at any time. Hold it out in the open or more covertly, and capture 2 hours of video and audio on a single charge. Begin recording with just one touch or set it to voice-activated recording. Store your footage to up to 16GB microSD cards (sold separately) and offload to your computer via USB cable transfer or just offload the card separately. The Mega Mini records in 640 x 480 resolution at 30 fps in AVI format. An LED indicator helps identify when you're recording or not. Three different desktop stand mounts are included allowing for different applications. BEST-IN-CLASSFEATURESORWIND SPY CAMERA’s*Key Features*:★ Super Mini Wifi Wireless P2P Spy Camera With Inbuilt Motion Detection. ★ Two Way Communication Speaker withMicrophone. ★ Inbuilt Battery Backup upto 4 Hours. ★ Day + Night Vision Clear HD Live Footage with 1080P Recording. ★ SuperEasy To Setup within 160 Seconds. ★ Awarded as the Best & the Most Reliable Hidden Camera in The World. 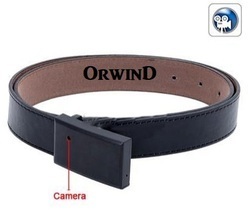 Belt Buckle Hidden Camera Camcorder Remote Control By Orwind+ Belt made of high-quality leather. + Hidden camera in the belt buckle. + Built-in 4GB TF card, support 8GB (max) TF card. + Mini USB port. + Resolution: 640 x 480 pixels. + Support video & audio recording. + Comes with 2000mAh li-ion battery, supply 2 hours recording. + Comes with wireless transmitter & receiver, can be operated by remote control. Belt Buckle Hidden Camera Camcorder with Remote Control - 4GB Belt Buckle Hidden Camera Camcorder with Remote Control - 4GB Belt Buckle Hidden Camera Camcorder with Remote Control - 4GB Belt Buckle Hidden Camera Camcorder with Remote Control - 4GB Belt Buckle Hidden Camera Camcorder with Remote Control - 4GB Belt Buckle Hidden Camera Camcorder with Remote Control - 4GB Specifications+ Belt made of high-quality leather.+ Hidden camera in the belt buckle.+ Built-in 4GB card, support 8GB () card.+ Mini USB port.+ Resolution: 640 x 480 pixels.+ Support video & audio recording.+ Comes with 2000mAh li-ion battery, supply 2 hours recording.+ Comes with wireless transmitter & receiver, can be operated by remote control.Belt Buckle Hidden Camera Camcorder Description: This is leather belt camcorder with hidden camera in the buckle that can support video and audio record with high resolultion of 640 x 480 pixels. It has built-in 4GB card, and it supports 8GB () card. Comes with 2000mAh li-ion battery which can be recharged via USB, supplys 2 hours recording. 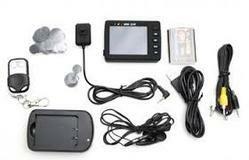 Comes with wireless transmitter & receiver, can be operated by remote control. 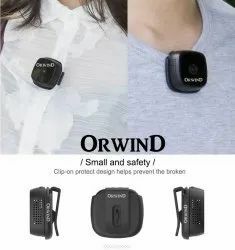 Package Contains :1 x Belt1 x CD1 x USB Cable | Belt Buckle Hidden Camera Camcorder Remote Control By Orwind+ Belt made of high-quality leather. + Hidden camera in the belt buckle. + Built-in 4GB TF card, support 8GB (max) TF card. + Mini USB port. + Resolution: 640 x 480 pixels. + Support video & audio recording. + Comes with 2000mAh li-ion battery, supply 2 hours recording. + Comes with wireless transmitter & receiver, can be operated by remote control. Belt Buckle Hidden Camera Camcorder with Remote Control - 4GB Belt Buckle Hidden Camera Camcorder with Remote Control - 4GB Belt Buckle Hidden Camera Camcorder with Remote Control - 4GB Belt Buckle Hidden Camera Camcorder with Remote Control - 4GB Belt Buckle Hidden Camera Camcorder with Remote Control - 4GB Belt Buckle Hidden Camera Camcorder with Remote Control - 4GB Specifications+ Belt made of high-quality leather.+ Hidden camera in the belt buckle.+ Built-in 4GB card, support 8GB () card.+ Mini USB port.+ Resolution: 640 x 480 pixels.+ Support video & audio recording.+ Comes with 2000mAh li-ion battery, supply 2 hours recording.+ Comes with wireless transmitter & receiver, can be operated by remote control.Belt Buckle Hidden Camera Camcorder Description: This is leather belt camcorder with hidden camera in the buckle that can support video and audio record with high resolultion of 640 x 480 pixels. It has built-in 4GB card, and it supports 8GB () card. Comes with 2000mAh li-ion battery which can be recharged via USB, supplys 2 hours recording. Comes with wireless transmitter & receiver, can be operated by remote control. 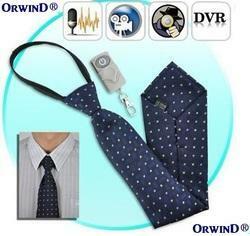 This necktie spycam is able to record 1280*960 video in AVI format. It has 4GB internal memory, which is able to Records up to 2 hours per recharge. Users can use the bundled remote control to turn the camera on and off. switch the master switch inside the tie to ON, then press remote button once to start recording (LED turns green). Press and hold the remote button for 3 seconds to stop recording and save video file. Wide visual view angle 62?? Our product is capable of recording video with a resolution of 640 x 480 @ 30 FPS that you can play back on a full-sized screen with no loss of quality. Resolution is the size of the image of 640 pixels horizontal by 480 pixels vertical, which happen to be your PC's VGA standards. The DV1650M supports up to a 32GB microSD card that can record 16 hours of quality video. With its small size (2.5" x 3" x 0.5"), you can easily tuck it away in a pocket and record video whenever you want. Dimensions: 2.5" x 3" 0.5"
Looking for Hidden Spy Camera & Secret CCTV Camera's ?